Your Happiness Factor: Zenchantment presents Zen Ocean - Spring Wild Flowers of California's Coast. 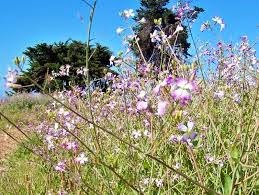 Zenchantment presents Zen Ocean - Spring Wild Flowers of California's Coast. The explosion of colors and unmatched beauty of wild flowers flourishing along the rugged coastline of California symbolizes the long anticipated arrival of Spring. Fields of wild flowers sprout seemingly overnight, their blinding brilliance competing with the brightness of the morning sun. Fragile petals of poppies flutter delicately in the afternoon breeze. Undulating waves of bright yellow mustard fields bow to an offshore zephyr. A distant lighthouse stands over a rolling carpet of vibrant ground flowers. Endless waves break and crash against the lofty cliffs in the background. Shades of purple, lavender and magenta are a testament to nature's endless bounty of vernal colors. The flourishing fields and clusters of Spring's wild flowers last for but a fleeting moment, soon to be at the mercy of relentless heat and then oncoming chill of California's coastal fog. Relax and enjoy over one hour of Spring wild flowers along the stunning California coast, inspiring reminders of nature's promise of new hope, rebirth, and renewal. Experience the ever changing scenery and moods of a Zen Garden, the mesmerizing power of the waves along the Northern Pacific Coast, the transient moment of a cumulus cloud passing overhead, the fragile fluttering of cherry blossoms on a spring breeze. Escape to uncharted and enchanted vistas of infinite serenity and bliss. Underscored by original soundtracks, Zenchantment takes ambient soundscapes into a decidedly hypnotic, meditational direction; fusing quiet, mood induced textures into a visual sound collage. Together, the minimal soundtracks and sublime scenery convey the fragile and temporal beauty of nature's handiwork in flux. Experience transcendent moments of nature that evoke the reverential and the serene. Experience the visual poetry of life. Experience Zenchantment. Please visit www.zenchantment.com for information about our other Zen Garden videos. Zenchantment brings you the Zen Garden series, and other popular landscape "tonal poems" for deep relaxation, inner peace, mindfulness, and meditation.